BitBull Capital was among the few dissenting voices earlier this year who projected Bitcoin’s value falling steeply. As a leading active manager, our alpha above passive investments like indexes comes from methods including protecting our investors when a crypto asset like Bitcoin falls in value. 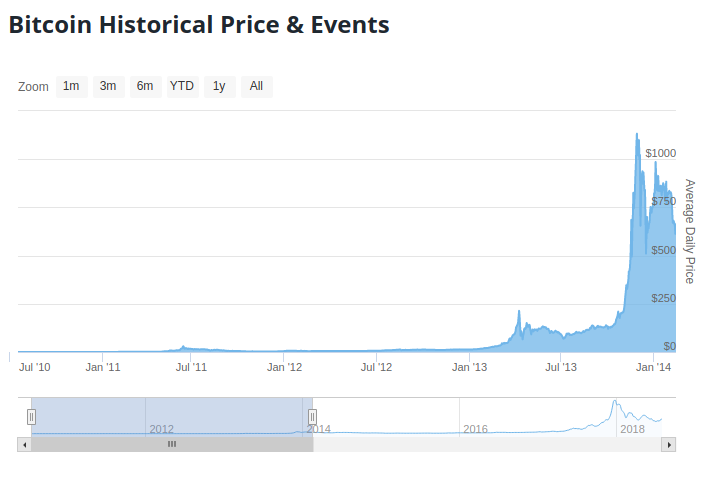 In our July 3rd article published in the midst of Bitcoin’s rise from $6,530 to $8,200 later that month after falling from its height of almost $20,000, we wrote our research piece “Bitcoin to hit $5,000”. And when it fell to $5,000, we were one of the few to maintain our bearish viewpoint, although it was contrary to almost everyone else in the industry. Now, our bearish viewpoint has changed. Bitcoin is now at a major buy point, and the best price it’s been in 14 months. On November 27, 2018, Bitcoin closed at $3,779, its lowest point since Sept 24, 2017, when it closed at $3,683. BitBull Capital expects Bitcoin’s price to increase from this point forward. With major industry strides, including both NYSE and Nasdaq announcing that Bitcoin futures will launch in the first quarter of 2019, large institutional money is beginning to buy. If you missed Cyber Monday, Bitcoin is still on sale, though this will also go away soon. 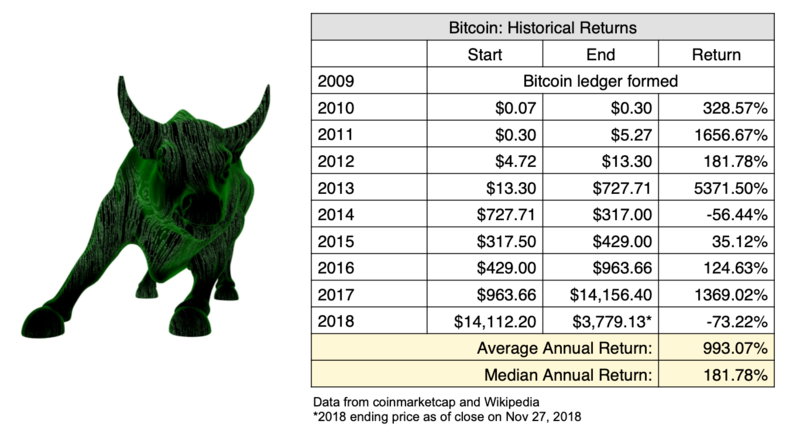 Since its inception, Bitcoin has returned an average of around 1000% annual return but is down about 85% this year. Bitcoin’s volatility and steep price movements have made investors wary, and timing has become a key factor since most cryptocurrency investors take a passive approach and prefer entering low and exiting high in the future instead of opting for more active trading strategies. Given this, one of the most frequently asked questions we hear is: “when is the right time to buy Bitcoin?” Finally, the answer is “now”. As a leading active manager, our research team consistently seeks alpha. Repeatedly buying low and selling high is one way that active managers outperform an index; this strategy is especially common in crypto where the high volatility creates many opportunities to profit off of that volatility for a crypto hedge fund’s investors. Other ways include market-neutral strategies such as quantitative and arbitrage; and access to select deals, such as private equity rounds in crypto companies like Coinbase or in sought-after pre-ICOs, such as Ethereum’s at about $0.35 per ETH. All of these are strategies that BitBull’s funds have used, and we write more about both these deals and ways that active funds can profit on bitbullcapital.com. Active management in crypto consistently returns higher than indexes; while a Top 10 Index performed at -26% Inception to Date (Nov 2017 through Oct 2018), a Crypto Hedge Fund index reported +21% performance over a similar time period. Bitcoin is much more volatile than many other assets with a market cap in the hundreds of billions, but it still displays common patterns and formations found in other (traditional) asset classes. 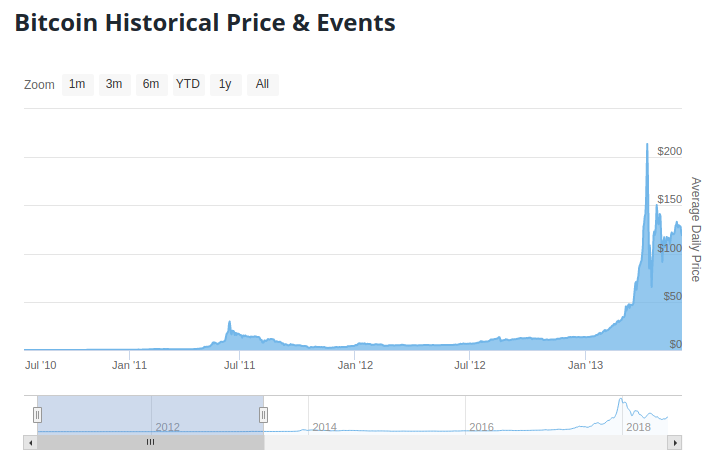 Let’s review a history of Bitcoin events and prices. New Liberty Standard opens a service to buy and sell Bitcoin, with an initial exchange rate of 1,309.03 BTC to one U.S. Dollar, a rate derived from the cost of electricity used by a computer to generate or “mine” the cryptocurrency. Adrian Chen’s exposé on Gawker, “The Underground Website Where You Can Buy Any Drug Imaginable,” is as provocative as it is popular. The sudden realization that Bitcoin has a useful value – one that’s entirely unique – hits home for many people. The article linked to the Mt. 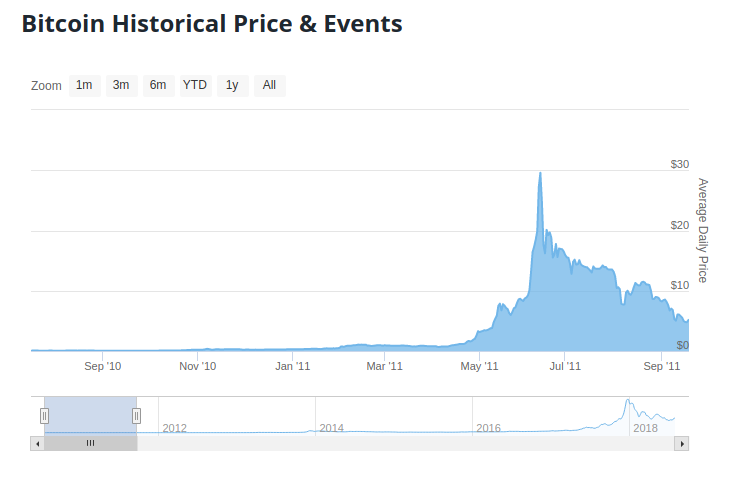 Gox exchange and contributed to an enormous upswing in price that beat all previous records. The cryptocurrency rose to over $31 per bitcoin just one week after publication. Alas, Bitcoin soon retreated down below $10 within short order. 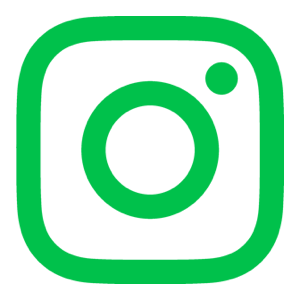 A disruption that was originally thought to be a Distributed Denial-of-Service (DDoS) attack on Mt. Gox, then the largest bitcoin exchange, was actually a huge influx of traders on the heels of Cyprus’ bailout announcement. This overwhelmed Mt. Gox’s servers, causing trades to stutter and fail. Speculative concerns about the exchange’s hiccups feed a powerful panic-sell that saturated the market and drove prices down to pre-rally levels before rising again a few days later. Rapidly growing Bitcoin investment from China steadily drove prices higher until they reached a peak on November 29th. Chinese citizens subject to strict controls concerning the movement of money across the country’s borders embrace the freedom provided by Bitcoin with open arms as they seek an alternative to the Renminbi, the state’s inflating official currency. The origin of mainstream Chinese interest in Bitcoin is largely credited to Jet Li’s One Foundation, which publicly shared a Bitcoin wallet address when asking for donations in the wake of the April 20th, 2013 Lushan earthquake. The foundation received over 230 BTC in just two days, an event that was widely covered in the national media. Bitcoin cemented its glory year by hitting $20,000 in intra-day trading barely a month after surpassing $10,000 for the first time. This pop followed several weeks of considerable volatility, mixing rapid growth with sudden declines before finally boosting Bitcoin to anew all-time high. Bitcoin outperformed most reasonable expectations in 2017, and then valuations received a decisive push from the anticipated introduction of regulated futures trading and the successful implementation tests of the Lightning Network. The Chicago Board Options Exchange launched its Bitcoin futures product on Dec. 10, and CME Group (the world’s largest futures exchange) began trading the contracts on Monday, December 18. Bitcoin, the highest-valued of the 1600 crypto assets, increased in value 1369% in 2017 and 135% in 2016. 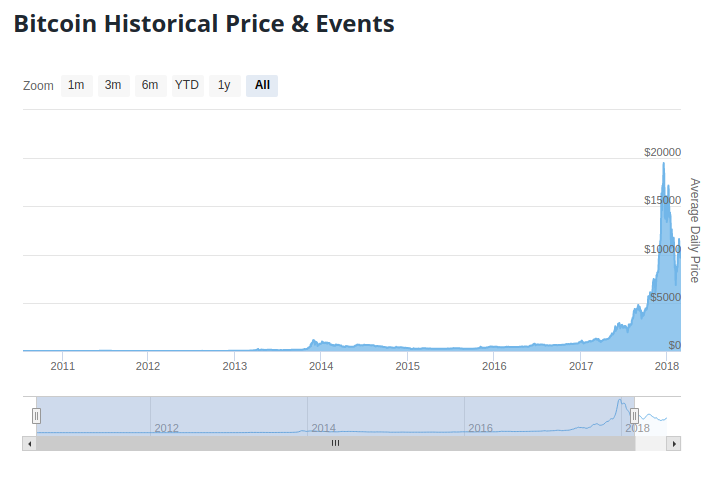 Ethereum, the second-highest-valued, increased 9383% in 2017 and 754% in 2016 (not shown). Many investors ask if we are in a 1999-type bubble for crypto investing Bitcoin valuations being down more than 50% retracement this year. Those looking to draw a parallel between today’s crypto markets and a historic equities market should look to March 2009. Even the initial drop in value from earlier this year was more comparable to a post-correction 2009 than 1999. Bitcoin dropped into the $6,000’s in February, its lowest price since November 2017. 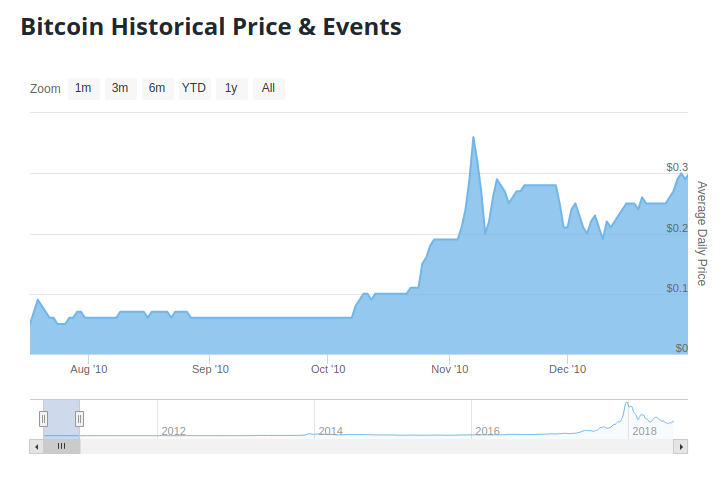 It’s continued to be volatile and went back up to $11,000 before dropping to a low of $3,779 on November 27, 2018. The recent price decline came at the heels of the Bitcoin Cash fork related hash wars and threats of crashing the price and attempts to spread fear, uncertainty, and doubt in the community – for instance, this Tweet by Craig Wright. Given the unprecedented price surge we saw late 2017 and early 2018, the retracement was an expected market move. The extent of the retracement was larger than many expected, but during the last few months, large investors and institutes have been strategically accumulating Bitcoin and continue to do so – all this is happening ahead of expected regulatory developments and approvals, such as the VanEck-SolidX ETF proposal. Moreover, in the coming months Bakkt, an exchange backed by ICE, will be launching physically settled Bitcoin futures contracts, which is also expected to renew investor confidence and create an actual demand for Bitcoins. We are also seeing university endowments invest in digital asset funds, including Yale, Harvard, Stanford, and others. Moreover, Nasdaq is reportedly planning to go ahead with Bitcoin futures in Q1 2019, despite the price decline, while NYSE also recently announced the launch of Bitcoin futures in January 2019. Finally, technical advancements, such as the explosive growth we are witnessing in the Lightning Network, are also positive signals. The Lightning Network’s capacity has surged by over 300% in November, and stands around 450 BTC currently. Not only are all these signs that Bitcoin is far from dead, they are precursors to what we believe will be a steady price recovery for the leading digital asset. Although we’ve seen volatility this year, the bottom is most likely in or very close, making this a major buy point for Bitcoin. The cryptocurrency is down around 73% from the start of this year and commonly-accepted retracement seen after parabolic arcs range from 60%-70%. We believe the current $3,700 pricing will be the absolute lows we see before a true trend reversal occurs. Savvy investors know the exact bottom is impossible to call, and long-term investors will want to evaluate whether they believe in the worth of digital currency. If you believe it has true disruptive potential, and will reach levels of $20K again, then the difference in return from investing at $3.7K vs slightly lower is missing the forest for the trees. 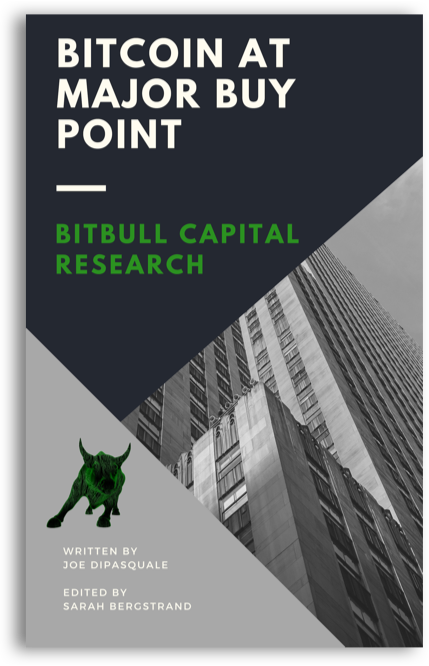 BitBull Capital’s ‘BullsEye View’ is that this pricing, the lowest in the last 14 months, is a major buy point, and one at which those who plan to ‘HODL’ should buy. If and when Bitcoin does hit $20K, many investors will be less focused on whether they got in at $3.7K or $3K, and more focused on whether they got in at all. September of 2017 saw impediments for Bitcoin’s value growth including China banning its trading, and Bitcoin went from $4,892 on Sept 1st to a low of $3154 on Sept 14th, 2017. Bitcoin then famously raised to an all-time high of about $19,497 on Dec 16th, and 20,089 in intra-day trading on Dec 17th, 2017. ‘BitBull’s funds’ refers to the funds we have invested in through BitBull Fund. Comparison used is a Top 10 Index Fund since its inception on Nov 22nd, 2017, through Oct 31st 2018, and the EurekaHedge Crypto-Currency Hedge Fund Index since Nov 1st, 2017, through Oct 31st 2018.